When it comes to history, I must admit to having a particular passion for the Anglo-Saxon age and especially the part it played in the story of the North East. Yes, of course we have the Romans and the wonderful Hadrian’s Wall but for me our region’s identity truly emerges with the Golden Age of Northumbria and the flourishing Christian art and culture of the seventh century. St. Cuthbert, the Venerable Bede and the Northumbrian king, Oswald, are the great figures of this age, whose remains all lie within Durham’s stupendous cathedral. They are still remembered affectionately across our region like old friends from a distant time. They are part of our folklore, our heritage. Even the dialect of our region has its roots in this age. Cuthbert would have understood that ‘to gan’ means ‘to go’ and as a monument to our region’s roots, beginnings and rich Christian heritage, Durham Cathedral is most certainly the place to go. The Cathedral is of course Norman, but its story has Anglo-Saxon roots, brought about with a little help from the Vikings and the settlement of a community of monks carrying St Cuthbert’s coffin to Dunholm – or Durham as it became. Here they laid their saint to rest in a simple, specially-built church some 98 years before the building of the Norman cathedral began in 1093. The cathedral provided a central focus for a monastic community whose influence stretched from Lindisfarne in the far north of Northumberland deep into North Yorkshire to the south. Today Durham Cathedral still carries this legacy as a focal point recalling the region’s earliest spiritual development and identity. With the help of the Heritage Lottery Fund, £10.9 million has been invested in the creation of a new exhibition that utilises two particularly wonderful buildings of the cathedral’s former monastery along with a new interconnecting gallery space. Together they serve to fulfil the legacy of recalling the story of the region’s spiritual enlightenment. They will provide visitors with an experience to match the cathedral’s international, cultural and historic value and aim to transform the way visitors enjoy the Cathedral and gain inspiration from it. 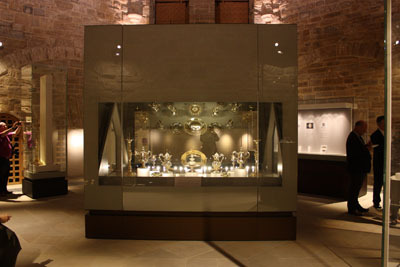 Open Treasure begins in the wonderful Monks’ Dormitory, entered from the cathedral cloisters by a short stairway or a glass lift both of which reward you with the exhibition’s opening scene – a stunning view of the dormitory itself, a great medieval hall 194 feet long and 39 feet wide. It is the only intact monastic dormitory in England. Once the sleeping quarters for Durham’s Bendictine monks, the Dormitory was commenced in 1398, in the era of Bishop Walter Skirlaw and we know the names of the medieval contractors who built it – John Middleton and Peter Dryng – but it is the work of a carpenter, Ellis Harpour that really grabs our attention for his spectacular oak beamed roof, the largest outside Westminster, and completed around 1404. New light is shed on old stones, in a quite literal sense, as we enter the Dormitory and find ambient, atmospheric lighting illuminating the rich features of the structure, the roof and the details of its ancient artefacts. An impressive collection of sculptured stones of the Anglo-Saxon and Viking eras, for so long a perhaps unloved and poorly interpreted feature of display, now take on a new life of their own. My particular favourites are the so-called Hogback stones of the Viking period from an era in which the Vikings were converting to Christianity. The era is reflected in the fusion or tension of conflicting Christian and pagan decorative styles. The sculptured stones come from across the region with a large number from the Vale of the Tees in south Durham and North Yorkshire. Wandering around we are drawn to explore the stones of different eras in detail; the carving of bears heads clutching the hogback stone, the carved name of an Anglo-Saxon nun from a convent at Hartlepool and the huge awe-inspiring crosses that tower above the collection. Much thought has been put into interpretation and information. Beautiful touch screens invite you to explore. Of special interest is a screen that shows the development and growth of the cathedral at different stages in its life. The stage that caught my eye was the cathedral in 1483 with the cathedral’s central tower at only half its present height. Since the tower’s later extension is currently in wraps as it undergoes repair it’s not too hard to imagine the cathedral in 1483 although back then the two western towers were twice their present height topped as they were by huge spires. Close by a colourful interactive screen that will appeal to young and old alike highlights the different roles of monks within the Durham monastery of which the cathedral was an integral part. You can pick a role to discover what their jobs involved. 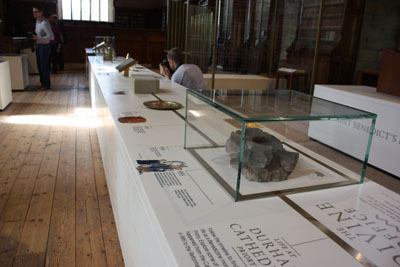 My favourite feature of the Dormitory exhibition is, however, a cathedral timeline set out along an illustrated display bench complete with artefacts from different eras. 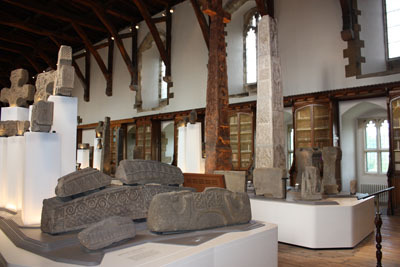 It is the great stone sculptures and crosses that dominate the scene in the Dormitory but special mention must be made of the grand bookcases that adorn the periphery of this hall, each uniquely crafted and containing books of many eras. In preparation for the exhibition they have been fitted with beautiful oak and brass screen doors each individually crafted by specialist carpenters to match the dimensions of each unique bookcase. At the south west end of the Monks Dormitory an attended door leads through to the next stage of the exhibition, where we enter the sudden coolness of the Collections Gallery where the atmosphere is closely monitored and sustained for the protection of exhibits. It is a surprisingly recent part of the cathedral, being nothing but an empty void until the 1950s when it was made into a linking passageway that later served as the Dormitory Library’s search room. A case displays some of the interesting finds discovered within the monastic buildings including fish bones from the old cathedral priory kitchen and a broom or ‘besom’ discovered under the dormitory floor along with horse racing sweepstake tickets left by joiners in 1852. Leaving the gallery, the next stage of the Open Treasure which will ultimately prove to be the highlight of the treasure is the spectacular octagonal kitchen (though it is square from outside) with its impressive and deceptively complex ribbed ceiling created by John Lewyn in 1366-74. Once surrounded by great fireplaces – their recesses can still be seen – it was here in the kitchen that the monks’ meals were prepared along with those of their guests. The building still served as a kitchen until the 1940s and more recently, up until 2011, it served as the cathedral bookshop. 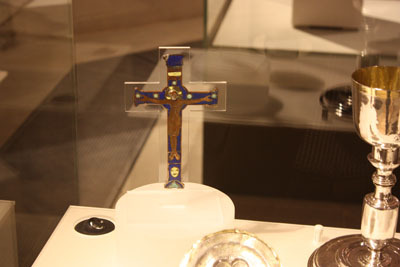 Here, the highlight for me is a copper and enamel 13th century crucifix discovered on the site of the fourteenth century Battle of Neville’s Cross which took place in 1346 on the outskirts of Durham City. Unearthed in the grounds of a house called Western Lodge in the 19th century it passed through a family line to a Mrs Patricia Alvis of Bideford in Devon who donated the cross to the cathedral’s collection in May. 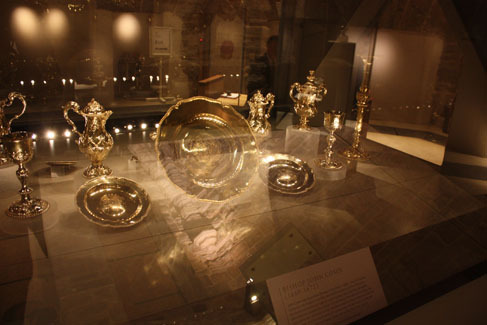 The main feature of the kitchen is the cathedral’s silver plate and particularly the impressive collection of Bishop John Cosin dating from the 1660s which is the centre piece of this grand building, for now at least. Next summer this central display area will become the permanent place of display for St Cuthbert’s 1,300 year old wooden coffin. It is important and only fair to note that the coffin and many of the most famous cathedral’s treasures are not going to be on display in the Open Treasure just yet. If you are hoping to see the St. Cuthbert relics including the famous pectoral cross of circa 640-670 AD or medieval manuscripts of later periods you will have to wait for now. This is for understandable reasons. Conservators have to ensure that the cathedral’s most precious and delicate items are properly and very carefully acclimatised to their new surroundings. The impact of visitors in all kinds of weather conditions and numbers on the sensitive micro-climates of the display areas has to be assessed. 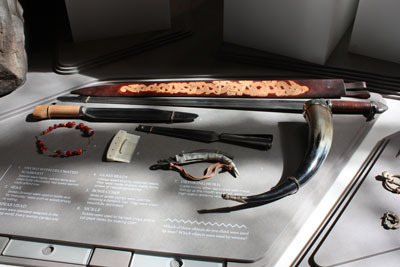 It will be very closely monitored to ensure that the artefacts are protected and preserved for generations to come. This means that some of the best-known treasures of the cathedral will not make their debut in Open Treasure until the summer of 2017. It is hoped that Open Treasure will attract 120,000 visitors a year and the admission price of £7.50 per adult and £2.50 per child to the exhibition is surely a worthwhile investment for the upkeep and conservation of one of the world’s most beautiful buildings. So, as the Anglo-Saxons might say “gan and-langes” (go along) and soak up almost 2,000 years of culture and beauty. St Cuthbert would surely approve. Open Treasure opens its doors to the public on Saturday July 23, 2016.